Draft: 2005, Los Angeles Angels, 10th rd. Peter Christopher Bourjos (BORE-jus)...On Twitter: @PeterBourjos8 ... 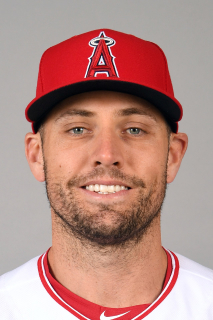 Nine-year MLB veteran returns to Angels on minor league deal...Has been with six MLB organizations (appearing with four) since departing Halos via trade in 2013 (Cardinals, Phillies, White Sox, Cubs, Braves & Giants)...Traded with Randal Grichuk to St. Louis for David Freese & Fernando Salas (Nov. 22, 2013) ... Originally drafted by Angels in 10th round of 2005 Amateur Draft (signed by LAA scout John Gracio)...Had committed to play baseball at Grand Canyon University (AZ) before signing...Graduated from Notre Dame High School in Scottsdale, AZ ... Named a minor league mid-season All-Star in 2008 (California League) and 2009 (Texas League)...2010 post-season All-Star (Pacific Coast League)...Named 2010 PCL Rookie of Year after hitting.314 (130/414) with 12 triples, 13 HR, 52 RBI, 85 runs & 27 SB with Salt Lake...Rated by Baseball America as Most Exciting Player, Best and Fastest Baserunner and Best Defensive Outfielder in PCL ... His father, Chris, is a scout for the San Diego Padres. Has made eight-straight Opening Day rosters, including 2018 with Atlanta after signing minor league deal March 25, 2018...Spent majority of 2018 Spring Training with Cubs ... In limited action with Braves in 2018, slashed to .205/.239/.364 in 36 games (DFA'd in June)...Signed minor league deal with San Francisco in July and finished season with Triple-A Sacramento. Peter spent the entire season with the Rays, with the exception of a brief D.L. stint and rehab assignment … appeared in exactly 100 games, his fourth-straight season of at least 100 games... Batted .260/.310/.442 (27-for-104) against lefties, compared to .179/.225/.310 (15-for-84) vs. righties... In the outfield, he handled 122 total chances without committing an error … only four other outfielders in baseball finished the season with as many total chances and no errors: Brett Gardner (253), Bradley Zimmer (176), Seth Smith (144) and Jon Jay (141)... He spent eight games (May 29-June 8) on the disabled list with tennis elbow... Hit .286 (18-for-63) in June and July ... batted .196 (11-for-56) from April to May and .188 (13-for-69) from August to October. Appeared in 123 games in his first season with Philadelphia … started 97 games (92 in right field and five in center)... Tied for eighth in the National League with seven triples … his .995 fielding percentage (1 E/188 TC) was the sixth-best among qualifying NL outfielders...Reached base via an error seven times, tied for the fourth-most in the NL...Batted .301 (46-153) with nine doubles, three triples, four homers, 15 RBI and 19 runs scored over his final 46 road games...Recorded a game-ending, infield single on 4/20 vs. the Mets...Went 34-76 (.447) with two doubles, three triples and three home runs over 24 games from 6/12-7/7, raising his average from .192 to .278...Reached base safely in 22 consecutive games from 6/17-7/16, batting .378/.427/.622 with five doubles, three triples, three homers and eight RBI...Registered a career-high 14-game hitting streak from 6/21-7/5, hitting .463 (25-54) with a 1.268 OPS...Was on the disabled list from 7/27-8/11 with with a sprained right shoulder … appeared in five rehab games with Class AAA Lehigh Valley...Was claimed off waivers from the Cardinals on 12/2. In first season with St. Louis, started 65 games in center and appeared in the field in 104 contests...Batted .220 before the All-Star break and .253 post All-Star break. Hit .360 (9-25) in August...Tied for team lead with five triples and ranked 2nd on team with nine stolen bases. Stole two bases vs. LAD on 7/20...Had 16 multi-hit games with two three-hit games (4/8 vs. CIN & 5/7 at ATL)...Had three pinch hits including a PH-2B (7/6 vs. MIA) and PH-3B (7/9 vs. PIT) and three pinch walks...Had 11 infield hits, 4th most on Cardinals, and three bunt hits, 3rd highest for STL...Hit four home runs, his most since hitting 12 in 2011 (w/LAA)...Hit 1st Cardinals HR on 5/7 at ATL (Mike Minor); 1st Busch Stadium HR on 6/3 vs. KC, a go-ahead shot off James Shields; 3rd HR of season was a game-tying shot off Clayton Kershaw on 7/20 and his 4th was 3-run insurance shot in 9th at BAL (8/10)...His season best hit-streak was five games from 6/3-8 (.375, 6-16, 3B, HR)...Provided game-winning hit with a two-out RBI single in 1-0 win vs. PIT (9/3); 2nd career (last vs. CWS 2011)...Underwent surgery for right hip impingement on Oct. 21...Had two at-bats (0-2) between the two rounds of postseason, appearing in five games...pinch hit in Game 1 of the Division Series at Los Angeles Dodgers and Game 3 of the League Championship at San Francisco...Played 4.0 innings of defense in centerfield as late inning substitution: 2.0 innings in DS Game 3, 1.0 inning in DS Game 4 and 1.0 inning in LCS Game 5. Appeared in 55 games for the Angels in 2013, batting .274 with 26 runs scored, three doubles, three triples, three home runs and 12 RBI... Missed a total of 103 games throughout the season due to injuries... Initially placed on the 15-day D.L. with a left hamstring strain 4/30 -6/9... Went back on the 15-day D.L. 7/1 (retroactive to 6/30) with a right wrist fracture; activated on 8/16. Returned to the D.L. 9/16 (retroactive to 9/4) until the end of the season due to his right wrist... Had season-ending wrist surgery on his right wrist on 9/8... Was batting .313 at time of first injury, .333 at time of second D.L. stint and finished the season batting .274... Ran off a 10-game hitting streak 4/19-28, batting .447 (17-38) during the stretch... Batted .370 (17-46) in the month of June, his highest career monthly average with at least 50 plate appearances... Posted a .351 (13-37) batting average in close and late situations... Robbed J.J. Hardy of a home run June 11. According to ESPN Stats and Info, it was the fifth time in his career robbing a home run, tied with Cameron Maybin for the most in the majors since 2010... Hit first career leadoff home run on 4/15 at Minnesota. Spent second full season in Majors appearing in 101 games (48 starts) for Angels, batting .220 (37-for-168) with three home runs, 19 RBIs and 27 runs scored...Made second straight Opening Day start in center field for Angels...Made just one error in 501.2 innings in outfield in 2012 (.994 fielding percentage)...Halos were 64-31 in his 95 appearances in center field...Scored seven runs after entering game as a pinch runner, which ranked second in Majors, trailing only Seattle's Munenori Kawasaki (8 R)...Hit .277 (23-for-83) in 6th inning or later and .294 (5-for-17) in close or late situations...On April 11 at Target Field, recorded Halos' first inside-the-park home run since Gary Matthews Jr.'s on June 17, 2007, at Dodger Stadium...20th different Angel to accomplish feat in franchise history (26th occurrence)...Homered in back-to-back games on June 24 and 26. Spent first full season in Majors batting .271 (136/502) with72 runs, 26 doubles, 11 triples, 12 home runs, 43 RBI and 22stolen bases in 147 games (138 starts as CF)...Did not qualifyas a rookie in 2011 (181 at-bats in 2010)...First player inAngels' single-season history to collectively reach 25+ 2B,10+ 3B, 10+ HR & 20+ SB...Only other player in MLB to reachthose numbers in 2011 was Curtis Granderson...His 11 triplestied for A.L. lead and were most by an Angel since Chone Figgins' 17 in 2004...Ranked 2nd in MLB with 17 bunthits & 4th in A.L. with 36 infield hits...Angels' top hitter at home (.300)...Tagged seven HRs over his last 36games (5 HRs over first 111 games)...Six of his 12 home runs came in a 22-game span in August...Homered inthree consecutive games (8/19-21)...According to FanGraphs, Bourjos saved 21 runs in centerfield (2nd mostin MLB in 2011) as part of an Angels outfield that led the Majors with 38 defensive runs saved...Collected firstcareer walk-off hit Aug. 23 vs. CWS with RBI single with bases loaded in 9th...Activated from D.L., July 23...Left July 7 game in 8th inning with right hamstring tightness (placed on DL 7/8)...Missed 11 games in first D.L.stint of career...Career-best 12-game hit streak April 17-30...Scored career-high four runs May 5 at Boston...Tied club record with two triples April 26 vs. Oakland. Bourjos does not qualify as a rookie for 2011...Called up from triple-A Salt Lake on August 3 and appearedin 51 games with Angels...Was Halos' starting centerfielder in 50 of his 51 games...MLB debut as startingcenterfielder on Aug. 3 at Baltimore moved Torii Hunter to his first start in corner outfield spot since 1999...With Angels, finished with a .204 (37/181) clip, 19 runs scored, six doubles, four triples, six home runs, 15RBI and 10 stolen bases...16 of his 37 hits went for extra bases...Batted leadoff his last nine games (first suchstarts of his career)...Hit .250 (11/44) in the role...Logged eight outfield assists in his first 26 starts, most by arookie in that span in at least the last 40 years (ELIAS)...His 10 outfield assists led all of MLB from the date ofhis debut until the end of the season...10 outfield assists finished tied for 6th in A.L... Bourjos threw out morebaserunners by himself than 18 of the 30 teams in baseball - all in just 51 games...HR in 2nd inn. on August 21at Minnesota was first of MLB career and front end of back-to-back HRs with Bobby Abreu...Collected first twoMajor League hits on August 4 at Baltimore...Named 2010 PCL Rookie of the Year after batting .314 (130/414)with 13 HRs, 13 2Bs, 12 3Bs, 85 runs and 27 SBs for Salt Lake. Ascension up minor league ladder continued with solid performance in first season at double-A Arkansas...Speedsterled Texas League with 14 triples and ranked fifth in circuit with 32 stolen bases...Led Arkansas with 72 runs scored...Named as Angel Organization's Defensive Player of the Year as he committed just one error in 110 games...Was alsoa Texas League All-Star selection...Added to Angels' 40-man roster in off-season. Finished 2008 at Rancho Cucamonga second among all Angels minor leaguers with 50 stolen bases...Selected toplay in 2008 California League All-Star Game...Led California League in 2008 with 50 stolen bases and ranked fifthwith 150 hits...Also led Quakes that season in doubles (29), runs (83), and at-bats (509) and finished second onclub and league with 10 triples. Spent majority of sophomore campaign at single-A Cedar Rapids...Stole 19 bases and added six triples...Alsoappeared in four games with Angels rookie club in Tempe (.313, 1 2B, 2 RBI). Opened professional career at rookie level Orem in 2006...Logged 28 extra-base hits in 65 games for a career-best.472 slugging pct...His seven triples ranked third in the league...Named Pioneer League Honorable Mention. March 27, 2019 Los Angeles Angels selected the contract of OF Peter Bourjos from Salt Lake Bees. November 17, 2018 Los Angeles Angels signed free agent OF Peter Bourjos to a minor league contract and invited him to spring training. November 17, 2018 OF Peter Bourjos assigned to Salt Lake Bees. November 2, 2018 CF Peter Bourjos elected free agency. July 13, 2018 San Francisco Giants signed free agent CF Peter Bourjos to a minor league contract. July 13, 2018 CF Peter Bourjos assigned to Sacramento River Cats. July 2, 2018 CF Peter Bourjos elected free agency. June 30, 2018 Atlanta Braves designated CF Peter Bourjos for assignment. May 31, 2018 Atlanta Braves selected the contract of CF Peter Bourjos from Gwinnett Stripers. May 1, 2018 Atlanta Braves signed free agent OF Peter Bourjos to a minor league contract. May 1, 2018 CF Peter Bourjos assigned to Gwinnett Stripers. April 29, 2018 Atlanta Braves released CF Peter Bourjos. April 25, 2018 Atlanta Braves designated CF Peter Bourjos for assignment. March 25, 2018 Atlanta Braves signed free agent CF Peter Bourjos. March 23, 2018 Chicago Cubs released CF Peter Bourjos. February 21, 2018 CF Peter Bourjos assigned to Iowa Cubs. February 19, 2018 Chicago Cubs signed free agent CF Peter Bourjos to a minor league contract and invited him to spring training. November 2, 2017 CF Peter Bourjos elected free agency. June 8, 2017 Tampa Bay Rays activated CF Peter Bourjos from the 10-day disabled list. June 3, 2017 Tampa Bay Rays sent OF Peter Bourjos on a rehab assignment to Charlotte Stone Crabs. May 30, 2017 Tampa Bay Rays placed LF Peter Bourjos on the 10-day disabled list retroactive to May 29, 2017. Tennis elbow. April 1, 2017 Tampa Bay Rays selected the contract of LF Peter Bourjos from Durham Bulls. March 28, 2017 Chicago White Sox traded CF Peter Bourjos to Tampa Bay Rays for Player To Be Named Later. March 28, 2017 CF Peter Bourjos assigned to Durham Bulls. February 14, 2017 CF Peter Bourjos assigned to Charlotte Knights. February 1, 2017 Chicago White Sox signed free agent CF Peter Bourjos to a minor league contract and invited him to spring training. November 3, 2016 RF Peter Bourjos elected free agency. August 12, 2016 Philadelphia Phillies activated RF Peter Bourjos from the 15-day disabled list. August 6, 2016 Philadelphia Phillies sent RF Peter Bourjos on a rehab assignment to Lehigh Valley IronPigs. July 28, 2016 Philadelphia Phillies placed RF Peter Bourjos on the 15-day disabled list retroactive to July 27, 2016. Right shoulder sprain. December 2, 2015 Philadelphia Phillies claimed RF Peter Bourjos off waivers from St. Louis Cardinals. October 14, 2015 St. Louis Cardinals activated CF Peter Bourjos. October 9, 2015 St. Louis Cardinals reassigned CF Peter Bourjos to the minor leagues. April 24, 2015 St. Louis Cardinals activated CF Peter Bourjos from the paternity list. April 21, 2015 St. Louis Cardinals placed CF Peter Bourjos on the paternity list. November 4, 2013 Peter Bourjos roster status changed by Los Angeles Angels. August 16, 2013 Los Angeles Angels placed CF Peter Bourjos on the 60-day disabled list. August 16, 2013 Los Angeles Angels activated CF Peter Bourjos from the 15-day disabled list. August 8, 2013 Los Angeles Angels sent CF Peter Bourjos on a rehab assignment to Salt Lake Bees. July 2, 2013 Los Angeles Angels placed CF Peter Bourjos on the 15-day disabled list retroactive to June 30, 2013. rRght wrist fracture. June 10, 2013 Los Angeles Angels activated CF Peter Bourjos from the 15-day disabled list. June 6, 2013 Los Angeles Angels sent CF Peter Bourjos on a rehab assignment to Salt Lake Bees. June 3, 2013 Los Angeles Angels sent CF Peter Bourjos on a rehab assignment to Inland Empire 66ers. April 30, 2013 Los Angeles Angels placed CF Peter Bourjos on the 15-day disabled list. Strained left hamstring. September 3, 2012 Los Angeles Angels activated CF Peter Bourjos from the 15-day disabled list. August 27, 2012 sent CF Peter Bourjos on a rehab assignment to Salt Lake Bees. August 22, 2012 Los Angeles Angels placed CF Peter Bourjos on the 15-day disabled list retroactive to August 19, 2012. Sore right wrist. July 23, 2011 Los Angeles Angels activated CF Peter Bourjos from the 15-day disabled list. October 22, 2010 CF Peter Bourjos assigned to Leones del Escogido. August 3, 2010 Los Angeles Angels recalled Peter Bourjos from Salt Lake Bees. April 3, 2010 Los Angeles Angels optioned Peter Bourjos to Salt Lake Bees. November 19, 2009 Los Angeles Angels selected the contract of Peter Bourjos from Arkansas Travelers. June 24, 2009 Peter Bourjos roster status changed by Arkansas Travelers. August 18, 2005 Los Angeles Angels signed CF Peter Bourjos.